Cultural difference, difference of opinion or just question of perspective? After a few visits to a Czech hospital you start to notice cultural differences between Czech and British attitudes, the main and most obvious difference has to be the attitude towards smokers… at a time when in the UK smoking has been outlawed from all NHS owned property and doctors are refusing to treat cancer patients who smoke, I was almost stopped dead in my tracks when I saw this kiosk in a Czech hospital. 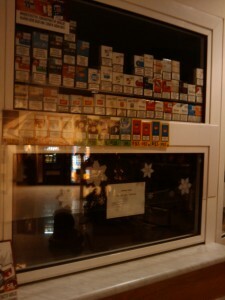 Now the more observant of you will notice the amazing array of ciggarettes available, and although this was partly what stunned me, (as the practice of selling ciggies in hospital ended longer ago than even I can remember! ), what took me aback the most is the location of this kiosk, not only is it in the hospital, but more shocking is the fact that this is the kiosk in the Oncology department… yup in Czech you can buy ciggerettes in the building where doctors treat cancer… Irony? you judge for yourself! So if you can buy Ciggies in hospital then obviously it is only fair you let people smoke them there as well… that goes without saying but to be fair you do have to go outside to the garden, (and with temperatures currently around -8 this is more than a little off-putting), but if you should go out to the smoking area what immediately becomes apparent is the sheer number of staff that are out there smoking too… so when being treated for cancer you can go to hospital, buy ciggerettes, and then smoke them, with the staff who are treating you! Now maybe having lived in the UK for maybe way too long now this comes as something of a shock to me, yet out here nobody bats an eyelid or gives it a second glance, so is it as shocking as I make it out to be or is it just shocking because of the attitudes I have become used to from living in the UK? I can certainly imagine that any Czechs who end up in UK hospitals would be mortified at the prospect of having to quit the fags during their stay. I guess the question needing to be answered is, is this a cultural difference, difference of opinion or just question of perspective? This entry was posted on December 17, 2009 at 8:04 pm. You can follow any responses to this entry through the RSS 2.0 feed. Both comments and pings are currently closed. 2 Responses to "Cultural difference, difference of opinion or just question of perspective?" haha great post steve 😀 made me chuckle!